This pumpkin cake is very similar to the pumpkin butter cake i made earlier, but this pumpkin cake is more flavourful as this recipe requires to add pumpkin puree, diced pumpkin, pumpkin seeds and sliced pumpkin, a 100% truly pumpkin cake!! In fact, this cake was really good ! 3. Add in pumpkin puree, milk and followed by flour, mix well. 4. Then add in pumpkin seed and diced pumpkin, mix until well incorporated. 7. 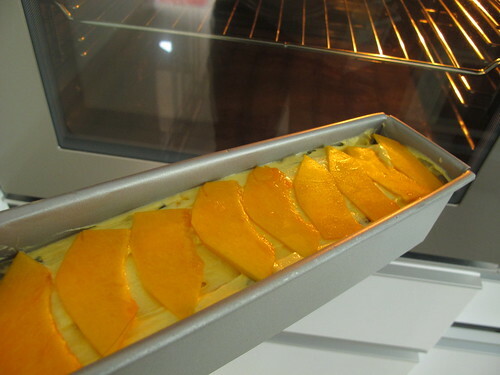 Bake at preheated oven at 180c for 40mins. Oh this cake had a very nice orange color and looks yummy too! This cake must be very soft and moist. I have never use pumpkin in making cakes before. Just wondering how it taste? I hope your sister and your sis-in-law will recover soon. Give your sister all the support and loves she wanted and I believe she can overcome this obstacles she is having now. I like golden colour and i can feel the texture is very smooth!! Hi Sonia, coincidently I also made a pumpkin cake yesterday (shall post it soon if have time) and I also made this cake before follow recipe from alex Goh book before I started my blog. I agree that this is truely very "pumpkinous" and moist:) urs look very very good. Lovely pumpkin cake. I would say it takes some time to heal when our loved one is not there anymore. My mum passed away few months back but i still deeply missed her as if the passing is yesterday. What your sister needs is the family supports and cares for her to go through this difficult period. Loved the texture of the cake. So soft and moist too. Sonia, I'm salivating by just looking at your pumpkin cake.How do make the top pops up like pop corn? Like the yellow-golden colour of the cake, yummy! luvly color & spongy one!!! The cake looks soft and porous. I like the colour, very bright and definitely blow away the Monday blues. Wish your sis and sis-in-law speed recovery. Warmest wishes for your sister and SIL to get well soon. Love the bright and sunny color of the cake! Oh, this is unique, Sonia. Great post! I hope your sister and SIL will be well soon. Best wishes to both of them. Love anything with pumpkin. Be it in kuehs or cakes. Like the idea of putting slices of pumpkin slice on the top. Make the cake look so rustic. nice cake and wish to hv a slice to test, can ah? Looks sooo good and it screams Fall to me! Oh send my regards to your sister & sister-in-law. Hopefully they get well soon! 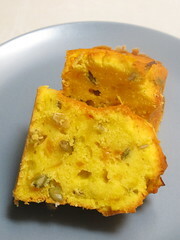 Btw, your pumpkin cake seems veru special, will like to try someday. 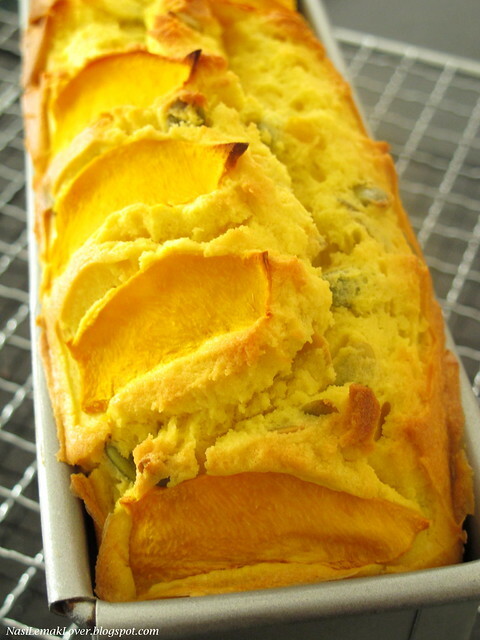 I like baking with pumpkins too, add such a bright color to the baked goods... delicious too! woww... I am going to make this... I love anything made with pumpkin!! This looks like soft and fluffy pumpkin chiffon cake! Hope your sis and sis-in-law gets better. I hope that both your sister and sis-in-law gets better soon. I'm glad that you like the cake! Yes, this is a lovely and delicious cake, with moist and excellent texture. Yours look great, would be lovely if I could have some for my breakfast! (My comment yesterday did not get thru??!!) Have a lovely day! Hi Sonia, hope your sis is a lot better under medication treatment. I am working in psyc unit, u can send me an email if you need any help. Wishing you all the best. What a pretty looking cake, the color is enticing n the texture is spot on! wow, that is beautiful...looks light as air! Looks super smooth, light and moist! Can't wait to try it. So moist and tasty. Check out my halloween event dear. 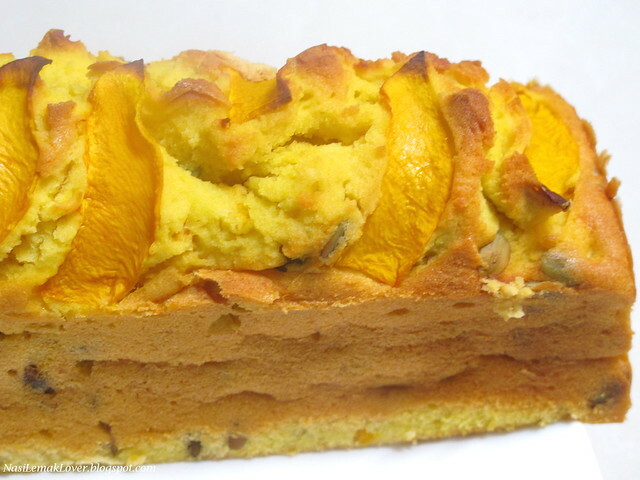 I will give your pumpkin cake a try as I love pumpkin and the cake looks moist and delicious. Normally I used it for pumpkin porridge. A quadruple pumpkin cake! Wow! It is so glowing yellow that even as someone who doesn't like pumpkin in sweets, I couldn't resist the temptation to taste and see if it's maybe THE exception. this is a must try recipe. I just did a pumpkin bread fr kitchen 70's recipe. Still left some pumpkin. Your photo tempted me to just bake one immeditely. hhehe...well done. The cake looks really moist and mouthwatering. Thanks for the recipe, sonia. So sorry about both you sis & SIL. Hope they will both get well soon. But still your sis will worried you the most. Will write to you soon. 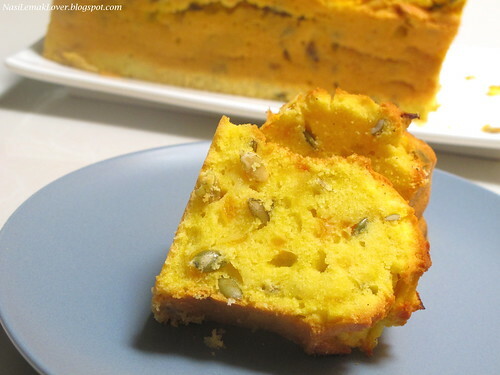 Love the color n texture of ur pumpkin cake! Can u advise where u bought the slim loaf pan? Thank you for the recipe for the pumpkin cake. It was really good and the texture was just right. i added some cheedar cheese on the top to give it a savoury crunchy bite. In the recipe, you have missed out pumpkin puree? I'm gonna make tomorrow since I hv a pumpkin ready in the fridge.. 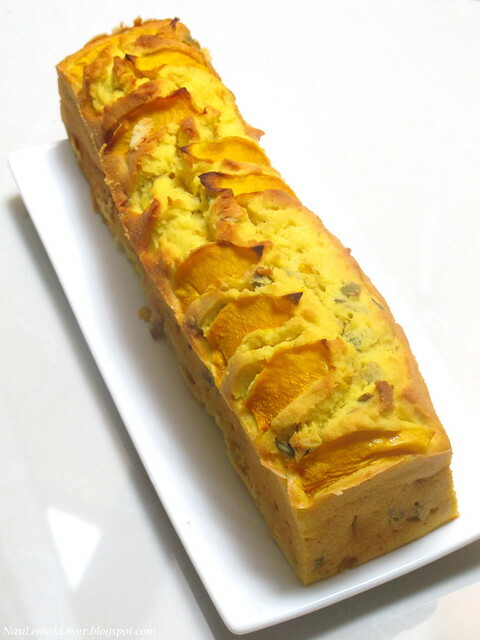 It's a great recipe, I made it without pumpkin seeds but still taste good:) Thanks. Just baked this. It's super nice! Thank you very much for sharing this recipe.